Whilst not as numerous as the cars on show at the Bangkok International Motor Show, there was still a very good representation from the two wheeled industry. Most of these exhibits were in the special motorcycle pavilion, but there were some dotted around in other areas, such as BMW, who had their giant R1200 RT motorcycle, which looks like a two wheeled car. The exhibit was complete with a lovely evening-gowned lady to explain it all, including how she was going to swing a leg over such a huge beast (no doubt she would have ridden side-saddle, as all nice Thailand ladies do). Incidentally this is known in the UK as Mr. Blobby! With Moto GP having easily overtaken Eff Wun as a spectator sport with real action, the motorcycle manufacturers were out in force to show their wares, backed by a racing pedigree. 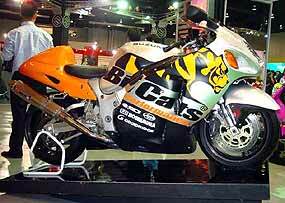 Honda displayed one of the bikes used by Sete Gibernau in the 2004 challenge where he came second. Number 15 is his favourite number. Unfortunately for Honda, he looks like coming in strong second again. 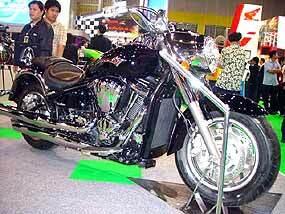 Suzuki had its monster Hyabusa on the stand. This monster is famed for shredding its rear tyres every 2,500 kays, so unless you take spare rubber, don’t buy this little beast as a touring bike! 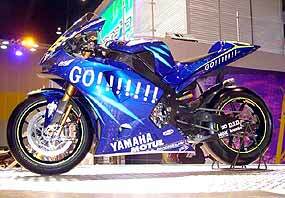 Yamaha did the impossible last year in the Moto GP series. Offered Honda’s 2003 championship winning rider Valentino Rossi a huge sack of gold to come and ride their previously outclassed Yamaha GP bike. 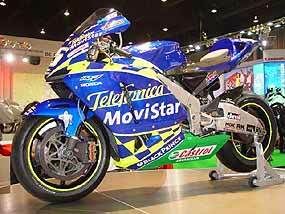 Rossi took the gold and ran away from the opposition, to win the 2004 crown and leave Honda gnashing its corporate teeth, and making a lifelong enemy of Gibernau. Yamaha are still saying, “Thank you very much!” and displayed a Rossi replica. These Moto GP bikes are 990 cc and are V5 formation engines, for both the Honda and the Yamaha. Yamaha also had their 1,670 cc big bike there as well, which would have to be another tyre shredder, and if it ever fell off the side stand you’d need a crane to get it upright. 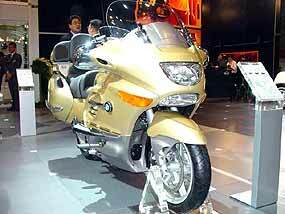 Not to be outdone, Kawasaki brought over their 2,000 cc V-twin. 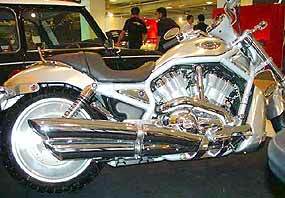 These bikes are now bigger than the Harley Davidsons that used to be thought of as the largest motorcycles. 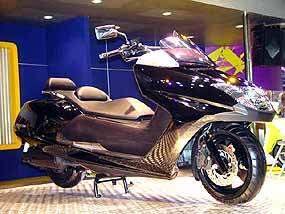 Proving that they can make engines as small as 250 cc, Yamaha stuffed one in a scooter, to make it the ideal runabout for a Thai family of seven. Harley Davidson did not have a stand in the motorcycle tent, but one of their bikes was on display in a special tuning stand. This was a weird and wonderful creation with a tube frame that looked like it was made of spaghetti. I reckon it would have to have all the torsional rigidity of a sponge cake. Our Down-under correspondent John Weinthal came through with the latest from Peugeot. Here are the Words from Weinthal. 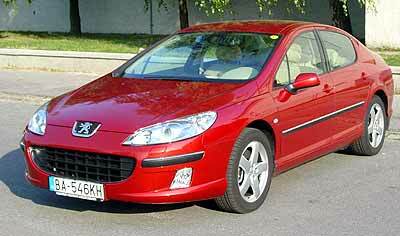 “France’s Peugeot is one of the world’s older car makes. It became a household name here when a round-backed 203 won the first Redex Around Australia in the 1950s. “Over the next 30 years the 203 and later models built substantial reputations as cars which were more than tough enough for outback Australia while setting high sedan standards for handling, ride comfort and near-silent ride. “The latest Peugeot to come here is the Camry-sized 407. This 407 has some of the most distinctive styling of any sedan or wagon around with a Ferrari-like mouth and long nose - to my eye it is extraordinarily attractive, though not all agreed. “Even more distinctive than the sedan is the panoramic glass-roofed 407 Touring, or station wagon. Both the sedan and wagon are offered with a 116 kW 2.2 litre four-cylinder engine, a 2 litre 100 kW diesel and a 155 kW V6. “We drove the V6 sedan with a six-speed automatic transmission which includes a tiptronic function for greater driver control, and an adaptive program which - in theory at least - means that the car anticipates your driving mood and adjusts change gear points accordingly. “The 407 range starts at $A 42,800 for a 6-speed manual ST sedan rising to $A 59,000 for the V6 six-speed auto wagon with all the toys most could wish for. They are exceptionally well-equipped and notable for their plethora of safety equipment starting with eight airbags across the range. “There’s ABS anti-lock braking with brake assist, an electronic stability program and most effective and smooth operating traction control - as one would hope in a near 1.5 tonne 155 kW front-wheel-drive family sedan. “There are parking sensors and automatic xenon headlamps with washers. Rain-sensing wipers turn on automatically and adjust wiper speed according to the prevailing precipitation. “The fully leather clad deeply padded seats accommodate five people with more than adequate head, leg and shoulder room. The steering wheel adjusts for rake and reach and the front seats are power adjustable. “That’s the good news - distinctive to look at, loaded with safety and comfort items and with a strong heritage, but the 407 competes in an arena crowded with worthy opponents. There’s the supremely competent supercharged Mercedes C class, Nissan’s excellent new Maxima (Teana in Thailand) and Honda’s Accord not to mention the appealing Citroen C5 which comes from the same stable as the Peugeot and is also available with a diesel and a V6. “The Peugeot has a few annoying features. The six-stacker CD holder is in the boot. The audio and climate-control buttons are small and confusingly arrayed meaning one’s eyes leave the road for any adjustments. The air-con, as on a number of European cars, only just coped with our recent hot weather and was no match for any Holden Commodore or Australian Ford Falcon or even the most basic Korean and Japanese offerings in the speed of cooling. “On road the 407 offers a soothing ride without setting any new standards in the areas of handling, communication with the road or isolation from road noise. Performance from the V6 is more than adequate but far from sporting. I am sure the four cylinder petrol engined 407 would struggle somewhat. Hyundai might be in trouble in some countries, but not in China. Automotive News in its China Conference reported on Hyundai’s expansion into the Chinese market, a marketplace that you ignore at your peril, if you are a motor manufacturer. According to Automotive News, three years ago, Hyundai formed a joint venture with the Beijing Automotive Industry Group. And now that venture - Beijing Hyundai Motor Co. - plans to sell more than 500,000 vehicles annually in China by 2008. That figure is just short of Thailand’s total production last year from all automakers here. Given the size of the Chinese market, any carmaker that is not a significant player in China will slip down the global rankings of top automakers, Automotive News reports. It is the job of Beijing Hyundai President J.M. Noh to make sure that doesn’t happen to Hyundai. “We want to enter the ranks of the world’s top five automakers,” Noh said in a 2003 interview. “We know we can’t get there without increasing our Chinese market share.” With the sheer size of the Chinese market, you don’t have to be a rocket scientist to see that Mr. Noh is right! Last week, I asked what was the weight of Karl Benz’s first vehicle (without driver). The answer was 265 kg! So to this week. We mention Peugeot this week, so let us look at the connection between the Peugeot company and Porsche’s 911 series. Just what is the connection?